The course was of tremendous help, and I can’t thank you enough. I feel very happy today since I passed the PE exam. Thank you very much for the wonderful course. I owe Test Masters a tremendous Thank you! I have been promoting yall all over SC. My selling point is that instead of teaching lots of material, you taught us how to pass the exam. It worked for me and the majority of people in our class! I am pleased to inform you that I not only passed the exam but also increased my score by nine points. The course and workshops were invaluable – I am using the materials from the course for my work. I would like to take just a moment to THANK YOU for your efforts on my behalf as well as on behalf of all engineers who have successfully taken your course. I am now a P.E. (Civil Engineer) and have realized a lifelong dream. As I have been a practicing architect for nearly 25 years, this is really the capstone of a long, demanding career. I am happy to say that I achieved a passing score for the test. It was quite a relief and I was elated with the result to say the least. I believe the course was fundamental in my success. This was the first time I took the test, and I think Testmasters helped out tremendously in preparing me for the exam. I had to plan a wedding at the same time (my wedding was 6 days before the test), and I only depended on the Testmasters classes and workshops for studying. So with that said, I am very thankful to you and other instructors for well-preparing us for the test! Thanks again. A thousand thank you’s for all your help during the preparation for the PE exam. I was fortunate to pass the exam on the first try and this would not have been possible without Testmasters. Your course was able to provide a thorough overview and tips/hints to get through the exam. Thanks again! I am happy to report that I have passed the PE examination. I don’t think that I would have passed if I did not take the Test masters course. The comprehensive review far exceeded what I could have accomplished studying on my own. Thanks. The course was a huge help, especially since I am an electrical engineer by degree and was able to pass the civil test. I passed the exam. Thank you for the class, I believe that it helped tremendously in my successful exam preparation. I believe your course to be instrumental in my success and further that it was an excellent broad presentation of Civil Engineering. I would recommend the course not just for passing the test, but for any engineer desiring exposure to the technical aspects of Civil Engineering practice. I believe it vital for anyone to attend a course like yours to prepare for the exam. When I first considered taking the exam I was overwhelmed by the amount of subject matter. 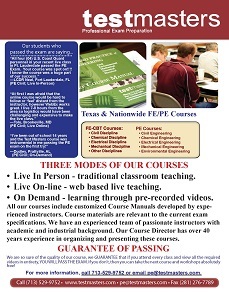 Your course provided a careful and reasoned approach to prepare for the exam. I cannot say enough to convey my satisfaction with your classes! The class was extremely beneficial. The directed studies provided tremendous value. Yes, I passed!!! Your class was excellent and I don’t see how I could have studied without it. Thanks for your help. Thank you very much for your well designed course contents. It really helped a lot. I must say that your course was a huge help in preparing for the exam not only from the standpoint of adding to my technical knowledge but in helping me tackle the exam in a logical and efficient manner. I am enthusiastically recommending your prep course to my coworkers. I want to thank you for the detailed preparation I received from your course. I was pretty nervouscoming into the first day of the prep course. But the material covered in class enabled me to complete the test with confidence and time to spare, in both the morning and afternoon sessions. Thanks again. I just wanted to let you know I passed the exam! I feel like the course was a huge help in getting me prepared. I passed the PE!!! I enjoyed the course and it really helped me pass. I passed the SC PE exam on the first try! Thanks for teaching the course in my area. I would not have passed it without it. Thanks again. Without your class I could not have passed the exam. My degree is in math so a lot of the material was new to me. Thank you again for all of your help. The course was extremely helpful because I actually received a B.S. in Chemical Engineering, so the course was the first time I had seen some of the items that were on the test. I am happy to say that I passed! Thanks for you help.